If you intend to care for yourself fully, you must invest in a good magnifying mirror that lights up. You cannot expect to create an expert swipe of the eyeliner, or tweeze to perfection, or realize the potential of your pore minimizing lotion without on. Trust me. The next time you find yourself looking face to face with yourself in a brightly lit, well mirrored dressing room or a hotel room with a good a proper magnifying mirror (there’s a reason why actors’ benches and beauty parlors are set up the way they are–overhead lights create weird angles and a lighted magnifying mirror gives you a close-up and avoids the shadows) you will realize that you aren’t really looking at yourself in your standard bathroom mirror when you groom or put on make up. The mirror I use is from Frontgate. (no longer available). It’s oval and has an LED light but (similar to round one shown except shape/bluetooth and oval one except wall mount). I use it every single day. 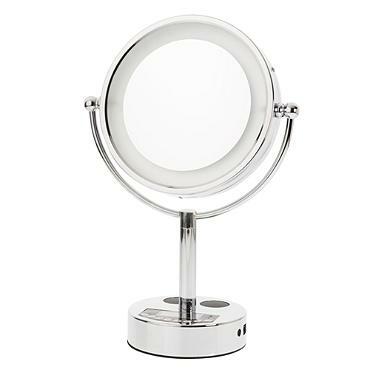 This entry was posted in Beauty, Cosmetics, Skin Care and tagged facial care, Frontgate, LED mirror, magnifying mirror by surgeoninheels. Bookmark the permalink.